Posted in participation with the Mattel #PlayAdvocate blogger program. As part of this program, special perks and incentives are obtained. Opinions and comments on this blog are those of the author. When it comes to music and my kids, they can't get enough. There is always someone either listening to music or making music in our house and as a parent, that is important. Music has many benefits for children such as reducing stress, encouraging us to stay active (can anyone say dance party?) and working a new area of our brains, music is a great addition to any child's life. Here are some great tips to help encourage music in your home with your little ones, there's nothing like expressing yourself through music! As a parent, this is probably one of the last things I would tell my children except when it comes to music. Many parents encourage their little ones through structured music lessons but this way of learning isn't for everyone, it can be quite stressful for some. While following directions and learning to read music is vital for any musician, so is finding your own beat. Encourage your kids to break the rules once in a while by singing or playing a musical instrument how he or she pleases. This will give them the opportunity to fully express themselves by doing it! Music is a fun way to empower and express yourself. Making music with your kids allows you to communicate with each other in a way that words can't! Music will unlock your feelings, creativity and open the lines of communication. You can start them off with a fun music vuideo singalong in your living room or a fun family jam session, even if nobody really plays an instrument. You may even realize you're a better singer than you thought! It's challenging to listen to music without moving to the rhythm. To get your little ones moving and expressing themselves, try playing a variety of music styles to inspire them. Dance along with them and encourage them to try new things too! You'll be surprised where it takes you! Remember that no matter what way your kids want to express themselves through music, there is no wrong way because we all approach music with our own place of creative self expression! With this, we can all have fun! This month, Barbie™ is building up the #BeSuper message by encouraging kids to embrace their inner rockstar with the launch of The Rock N' Royals DVD in September! "In this upbeat musical, Barbie™ stars as Princess Courtney, a modern-day princess whose world is flipped upside down when she switches places with Erika, a famous rockstar. The two very different worlds collide when a mistake sends Princess Courtney to Camp Pop and Erika to Camp Royalty. While Princess Courtney and Erika learn to adapt to their different camps, they must come together when they find out both camps are at risk of shutting down. Through this process, they find their true voices, and come together for an epic sing-off that shows anything is possible!" To celebrate the DVD launch, Barbie™ is giving you the chance to win a trip to Los Angeles, California for the Rock n' Royals concert featuring a surprise special guest! 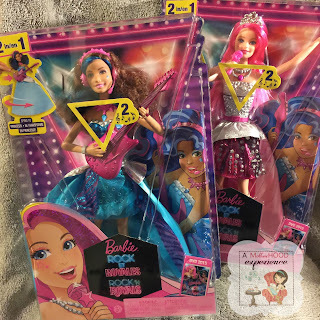 Visit www.barbie.com/en-ca/besuper/rock-n-royals to learn more about the movie and enter this amazing contest! Barbie™ knows what it takes to #BeSuper and wants to share the love! ONE lucky AME reader has the chance to win a Barbie™ Rock 'N Royals prize which includes TWO Barbie™ Rock N' Royals dolls plus TWO tickets to a special pink carpet screening of the Barbie Rock N' Royals movie in OTTAWA this October! This giveaway is open to residents of OTTAWA ONTARIO Canada 18+ or those willing to come from out of town! Travel and accommodations is NOT provided. By entering this giveaway you understand the terms and conditions on AME. Your information will not be shared unless you are drawn winner in which it will be shared with representatives of Mattel. Qualifying winners have 48 hours to fill out a claim form including skill testing question before another winner will be drawn. Ends August 31, 2015! Prizes can not be substituted or exchanged. Hopefully this only actually posts once I'm having trouble with it sorry! I entered to win the trip to L.A. I entered to win the Trip. Yes, I entered the contest. Yes, I've entered to win the trip - fingers crossed, I would love to win!! I entered. My daughter would flip if I won.